The conditions of the Dust Bowl pressed the farmers and ranchers into despair. Too many days with the sun blocked out by the Black Blizzards. Fine grains of sand covering everything, including the linings of the lungs. A losing battle with locust, grasshoppers and drought that devoured any hope of a crop. Watching children lose weight and the light in their eyes go out. How did the parents in the 1930’s cope with these circumstances? Sitting around their radio, they tuned into music that comforted their souls. As the agony of daily life left many with a feeling of total desperation, the words of Tommy Dorsey’s song spoke for those seeking guidance. Tommy Dorsey experienced a great deal of suffering and loss in his life, so the lyrics he wrote came from deep in his soul. “Precious Lord, Take My Hand.” Those in the Dust Bowl empathized with Dorsey’s anguish, and made this song their prayer. It is hard to imagine what a pastor of a church in the middle of devastating drought would pick to sing on a Sunday meeting. Maybe Fanny Crosby’s visual, “He hideth my soul in the cleft of a rock that shadows a dry thirsty land” brought a vision of God’s protection to those who felt vulnerable. For farmers, “There Shall Be Showers of Blessing” could be a hymn of hope when followed by “Bringing in the Sheaves.” These discouraged farmers owned barren, lifeless land. But their souls experienced a spiritual drought. Relief for the soil or the soul needed cloudbursts, showers of blessing. Rain that could heal the land and revive the heart. For the pastors, bringing the right song to the congregation proved challenging. Over the campfires of hobo camps or in the Hoovervilles, guitar players brought music to those riding the rail or enduring eviction. The songs of cowboys reminded these nomads of happier times. “The Red River Valley”, “There Will Be Peace in the Valley”, “You Are My Sunshine,” or “Happy Trails to You” lent themselves to group singing and recalled the voices of the Sons of the Pioneers, Gene Autry or Roy Rogers. 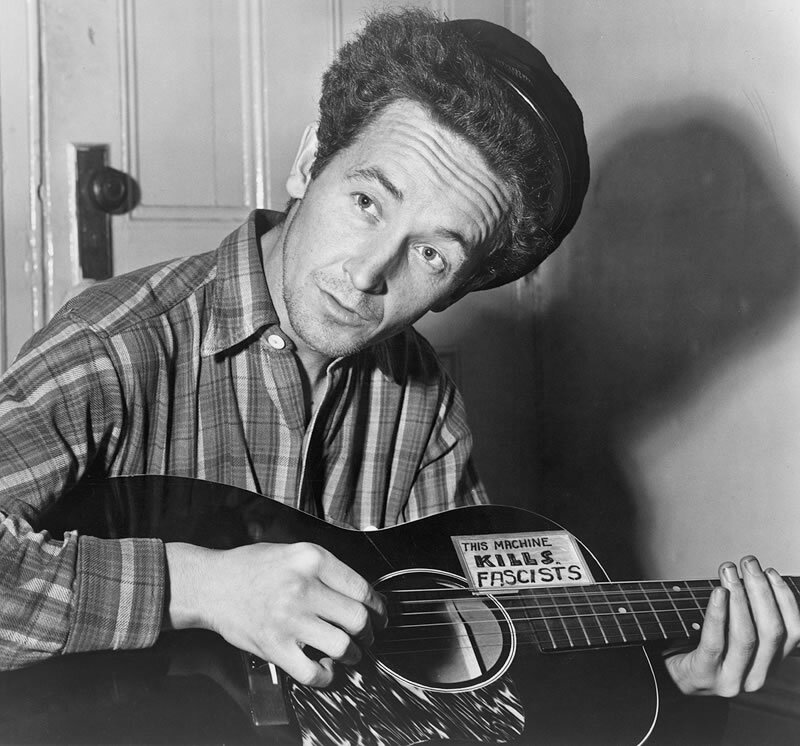 A musician among them, Woody Guthrie sang, “So Long, It’s Been Good to Know You” and wrote “This Land Is Your Land.” These iconic songs defined the plight of the men on the road and gave them a sense of community. In the late 1930’s, when the Wizard of Oz exploded on the big screen, the hearts of the Americans in the Dust Bowl were searching for a place where everything was green and wishes could come true. They wanted the difficulties of life to be manageable. It was the mix of reality and a break from the harshness of reality that made Wizard of Oz successful. A place where the dreams that you dream come true. A place “Somewhere Over the Rainbow” where life would become normal again. 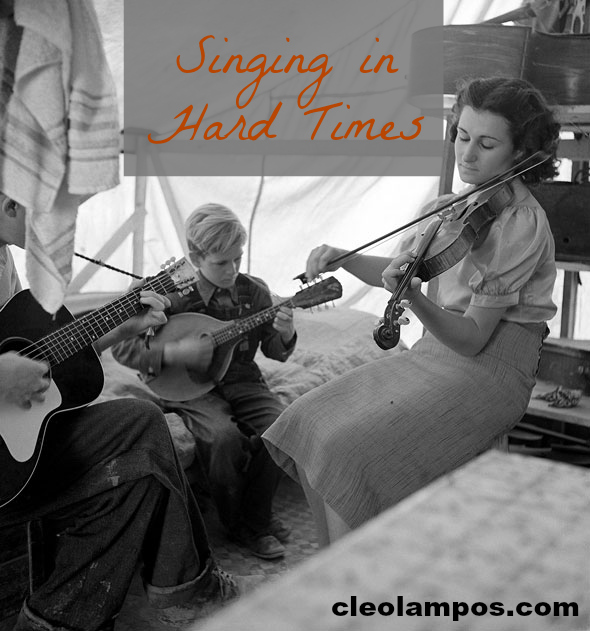 Meme photo credit: “Migrant family from Arkansas playing hill-billy songs,” Farm Security Administration emergency migrant camp, photo by Dorothea Lange, February 1939 :: via the Oxford American. 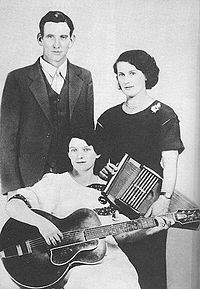 Albert Brumley, Carter Family, Dust Bowl, Fanny Crosby, hobos, Hoovervilles, Tommy Dorsey, Wizard of Oz, Woody Guthrie. Bookmark. Second Chances is FREE on Kindle until March 2nd!